Chez Francois is expensive, but worth every penny. It is the perfect location for a romantic date or birthday or anniversary celebration. It’s expensive, it’s upscale, and you’ll need to dress up if you want dine at this place. Men must wear jackets and will be given one if you forget. As one Yelp reviewer said, “It offers top-level, chef-driven food made from scratch with very fresh ingredients by the hand of a masterful chef classically trained in French cuisine.” Everything here is cooked to perfection. The service is impeccable without being burdensome. This is fine dining the way it is supposed to be. The restaurant is located about a block from Lake Erie overlooking the Vermilion river. If you have trouble with steps, be forewarned because you have to climb down quite a few shallow steps to reach the restaurant. The dining room is impeccably decorated and the view of the river with the boats going by is simply lovely. The food is the star here. The menu changes with the season. Several of its signature items, such as the lobster bisque (Homard Bisque, en Croûte) and the French onion soup (Soupe a L’Oignon Gratinée) as well as the Beef Wellington (Filet de Boeuf Wellington à la Périgourdine), are always on the menu. 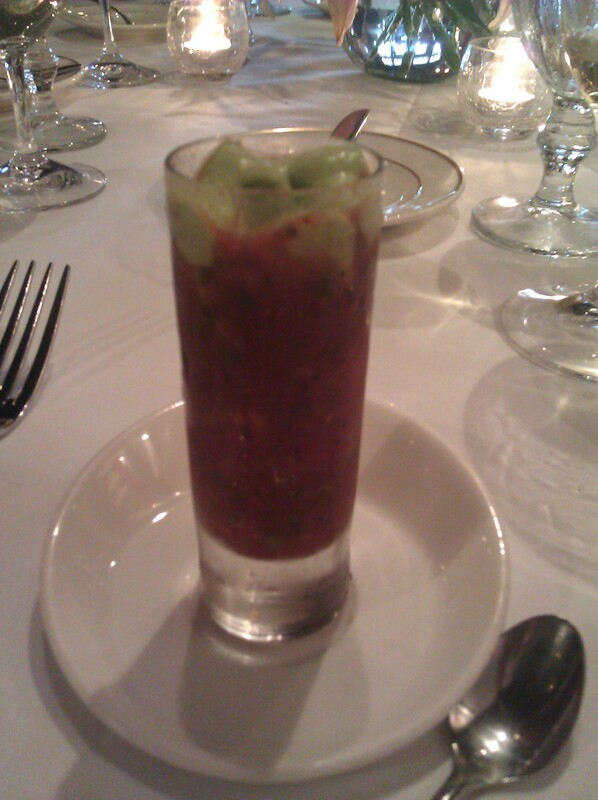 We started off our meal with an amuse bouche served in a small shot glass of what tasted like a summer gazpacho with an avocado foam. It was light and delicious. Bread was served soon after that – the loaf was warm and wrapped in a white napkin. 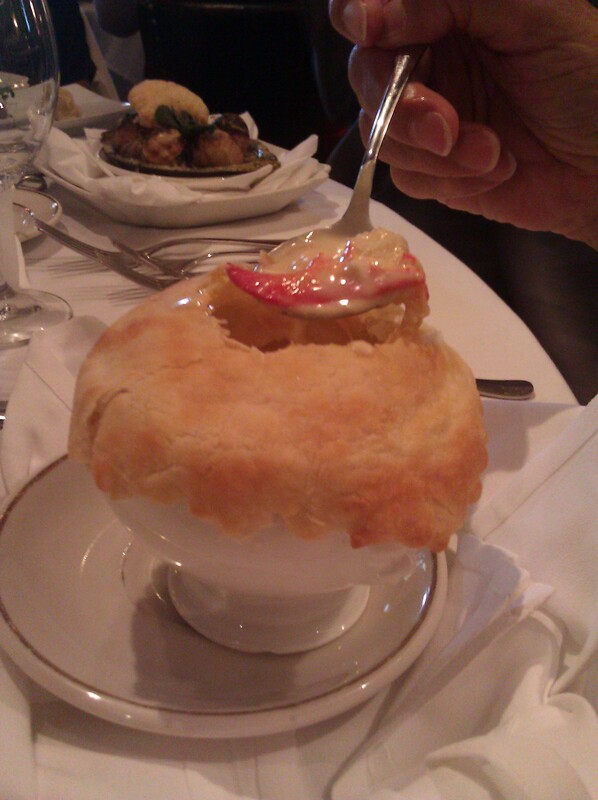 The lobster bisque features a puff pastry top and is loaded with creamy soup and chunks of lobster. I was able to try my friend A.’s bisque. It was perfectly seasoned. You will feel as if you’ve died and gone to heaven. I definitely plan on ordering it next time. I myself ordered the Escargot Basilic, which were delicious. You can see an order of them in the photo just behind the lobster bisque. The escargot features five large snails served in the shell swimming in the most decadent blend of sweet basil, garlic, shallots and sweet butter. It was topped with a little puffed pastry crescent moon that I used to sop up the leftover butter. When in a French restaurant, do as the French and try the escargot. I think you’ll be surprised at how good they are. 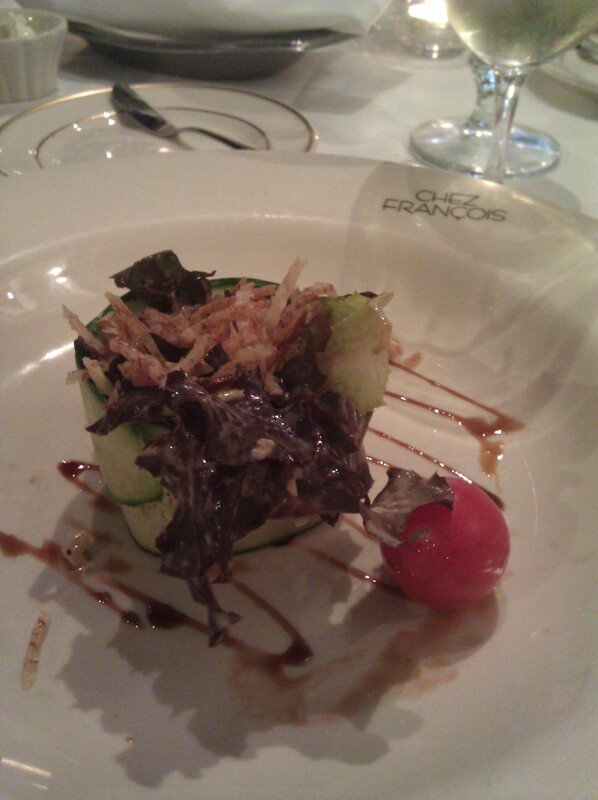 The entrees then came with an artful summer salad with a cucumber slice wrapped around it. The salad was perfectly seasoned, used the freshest ingredients, and not too large. 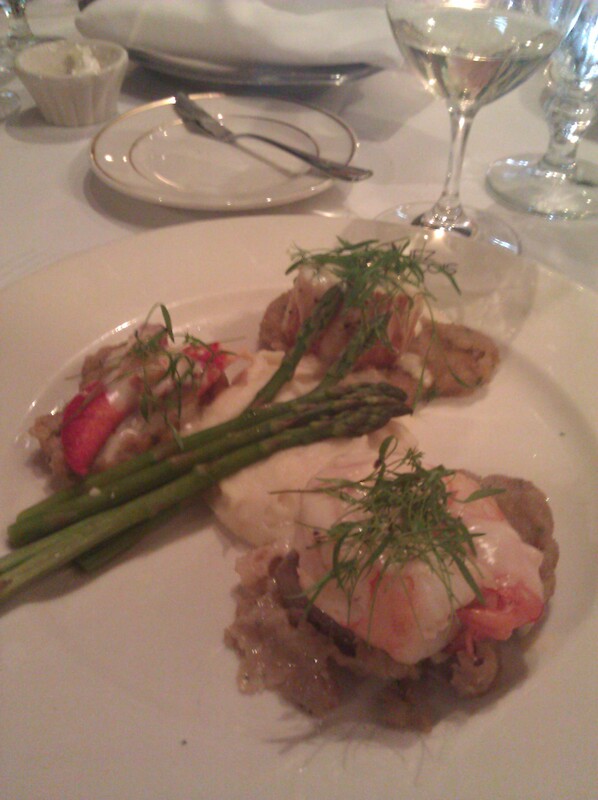 For my entree I ordered the Escalope de Veau aux Fruits de Mer, which featured sautéed breaded medallions of Provimi veal tenderloin with Maine lobster, a cold water shrimp, a Maine sea scallop and asparagus spears, topped with a Normandy wine sauce with fresh dill. Words simply can’t describe how wonderful this was. It was absolutely divine. Perfectly seasoned and not overcooked. The desserts were so delicious we simply couldn’t choose and ordered several to share. 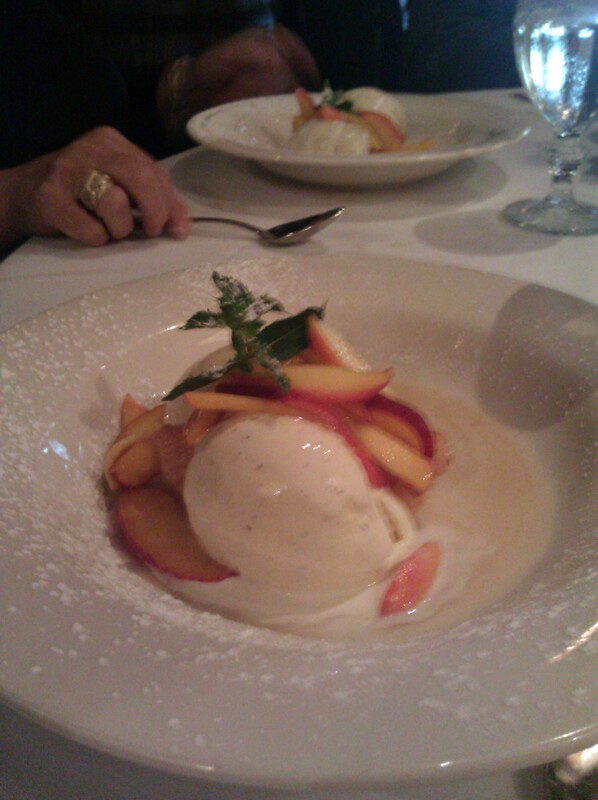 My favorites were the fresh Ohio peaches over homemade ice cream and the chocolate mousse, which was topped with fresh blackberries. Every single member of my dining out group loved their meals, so you can’t go wrong with anything on the menu. Chez Francois also has special dinners and wine tastings, which are posted on the website. 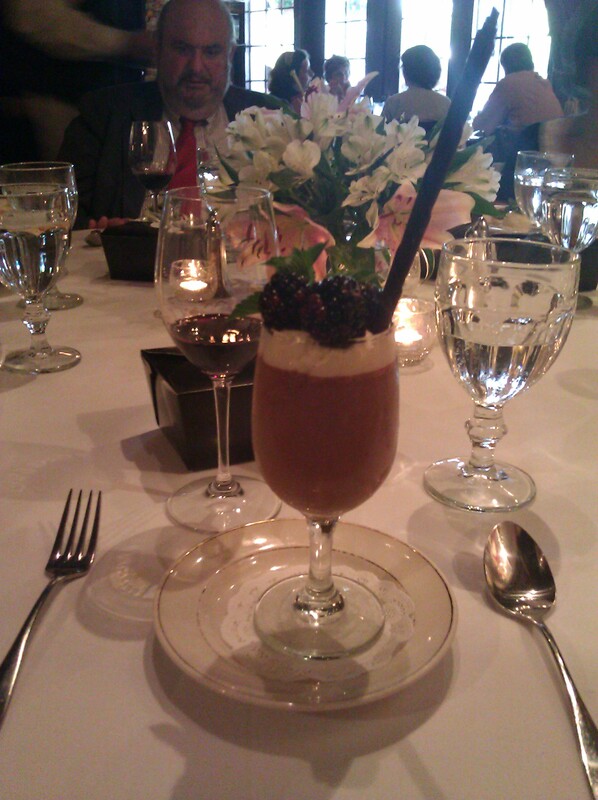 I attended the Bordeaux Wine Dinner this spring and was simply wowed from start to finish. Two of my tablemates didn’t drink, so if you don’t drink don’t let that dissuade you from attending a wine dinner or other celebration there. 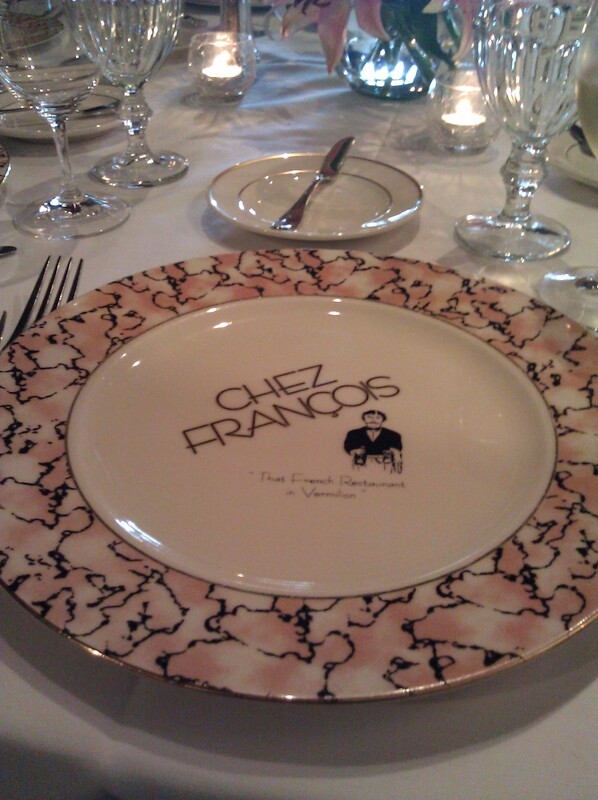 We love to dine at Chez Francois, too! The food and the atmosphere is outstanding! We love that they are a local farm to table restaurant, too. Wow, I’ll definitely add this to the list of restaurants to consider for special occasions. I tried escargot for when we went to France and I was an instant fan. Thanks for posting your experience!